Breakfast for dinner is one of those brilliant little feats that makes my world go 'round. Who can resist a short stack of pancakes or eggs with crispy bacon at such an inappropriate hour? Not this girl. I go for fluffy omelettes loaded with veggies and golden brown home fries on the side. So throw on your pajamas and grab your favorite coffee mug, because breakfast is served. 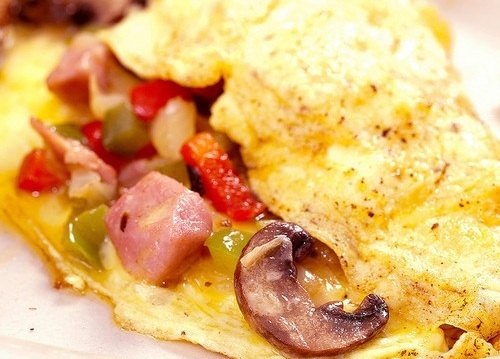 A Quick Tip: Omelettes take very little time to cook. For that reason, it is important to have all your ingredients in place and ready. This will make your cooking process more smooth and efficient. In a 10 inch skillet, heat the olive oil over high heat. You want the oil very hot, but not smoking. If by chance this happens, briefly turn off the heat and remove the skillet. Once the skillet cools down, return it to the stovetop. While the oil heats, crack the eggs in a bowl, add the milk, season with salt and pepper and whisk vigorously. Once the pan is ready, pour the eggs into the pan. You should hear a nice crackling sound and that's exactly what you want. Immediately cover the eggs with a lid or plate for approximately 1 minute. Remove the lid and take a quick look. You want the eggs to be slightly puffed and a little runny on top. Now it's time to flip the omelette. My dad has a technique which I have dubbed the "Lift and Flip" method. Lift the skillet with one hand and place the spatula under the eggs with the other and flip. Lower the heat to medium-high. While the other side is browning, arrange two slices of swiss cheese, the spinach, mushrooms and tomatoes on one side of the omelette. Slide your spatula underneath the omelette and fold it in half. To create a seal, press down on the omelette with the spatula. This will keep all of the veggies inside and make your omelette more compact. Remove the omelette from the heat and enjoy.